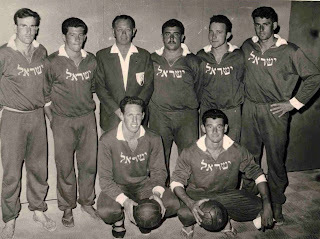 The National team of Israel prior to the game against Greece in Athens, July 27th 1959. Israel won the game with 8-6. Standing L-R: Uzi Beck, Edo Zorger , coach Maggi Rosenthal, Yesha'Aihu (Zambai)Elbaum, Issack Lherer, Micha Kanitz. Seating L-R: Reuven Shefa, Hagai Agam-Lavan.